In this post, we will go over steps required to migrate Notes to SharePoint and how to use Annotation2Sharepoint Project. The first step in the process is to identify entities which have associated notes/ document requiring migration as you will need a separate package for each entity. Document management is configured by Entity or by Account or Contact Entity. Check if Configuration is using GUID in folder path or not, I highly recommend not using GUID in the folder name (steps to change the config) for SharePoint document categorization, instead use just title or name(primary field) this does mean that you need an autonumbering solution to keep name or primary filed unique. It could also be useful to enforce this by creating an alternate key on primary field. In order to change the setting use OrgDBOrgSettings tool for Microsoft Dynamics CRM. The package moves the document from notes regarding Case entity to Sharepoint, it is built for default OOB SharePoint integration setup. so you will need to modify the package if using a different folder structure. Update the connection manager to point to your Dynamics 365 CE instance and Microsoft SharePoint. The package uses project parameter “FolderwithGuid”, set it to false if CreateSPFoldersUsingNameandGuid in OrgDBOrgSettings is set to false, the default value is true. 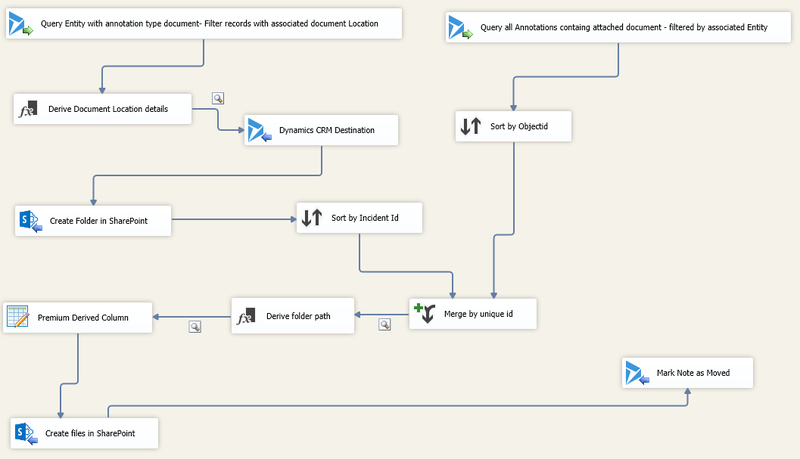 The data flow tasks have two Dynamics 365 data sources using fetchxml. A 2nd Data source is to retrieve the notes entity containing documents. Modify the fetch XML if migrating data related to another entity. The input from the 1st data source is used to create Document location record in Dynamics 365, modify the”Derive Document Location details” component and set below highlighted columns to entity schema name. Migrating documents from Dynamics 365 CE On-Premise Notes To SharePoint. Migrating documents from Dynamics 365 CE online Notes To SharePoint. Migrating from Fileserver to Sharepoint for a new Dynamics 365 CE installation. Please give the package a try and let me know if you have any comments. Let me know how migration went for you or any other integration scenarios that you ended up using this package. I hope that you find the package useful. I am performing this SSIS package for Quote but I got an error. Error at Migrate Documents from Dynamics 365 Notes to SharePoint [Premium Derived Column ]: The component is missing, not registered, not upgradeable, or missing required interfaces. The contact information for this component is “KingswaySoft Inc.; http://www.kingswaysoft.com; support@kingswaysoft.com; Copyright 2011-2017 KingswaySoft Inc.”. 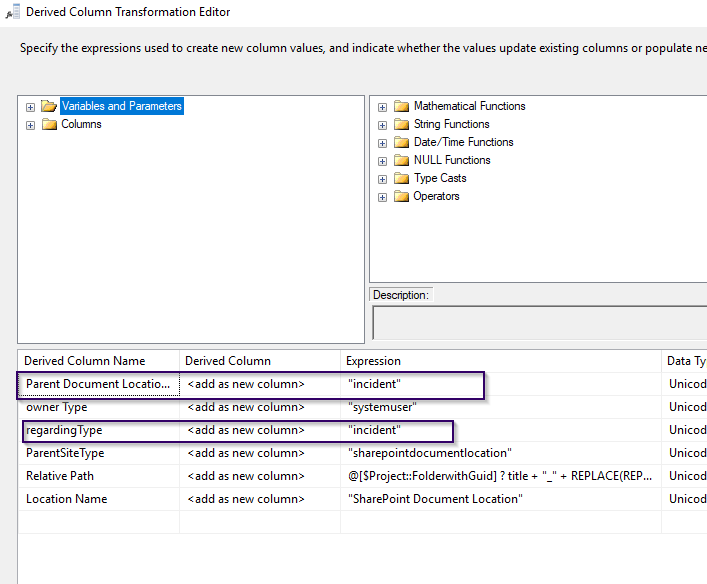 Error at Migrate Documents from Dynamics 365 Notes to SharePoint [SSIS.Pipeline]: Premium Derived Column failed validation and returned error code 0xC0048021. Error at Migrate Documents from Dynamics 365 Notes to SharePoint [SSIS.Pipeline]: One or more component failed validation. Error at Migrate Documents from Dynamics 365 Notes to SharePoint: There were errors during task validation. can you please help for the same. HI Pankil, it seems like you have not installed Connector for Microsoft SharePoint, Please install it and try again. I have resolve that connector issue for Microsoft SharePoint. Thanks a lot for that. but now I am facing another issue. If I upload more 2 MB files to SharePoint but it crashed, all the files converted in 1.46kb. HI Pankil, The Test feature on Expression editor will not work as you don’t have any input currently and documentbody is null. The Validate button next to text can validate if the expression is right. run the package for a small set of data to do actual validation.